High plant diversity is usually linked with high soil microbial diversity, which is hypothesized to be attributed to a high diversity of components in the soil leachate, but experimental evidence is scarce. 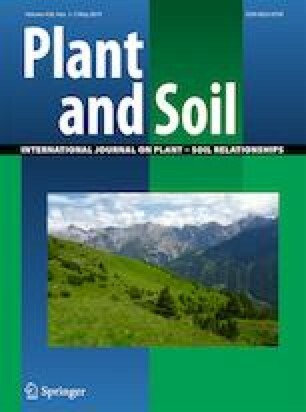 The aim of this study was to determine if the variation in soil leachate caused by plant diversity could affect the soil microbial community. A microcosm experiment was conducted to determine the effect of plant diversity on the soil microbial community by measuring soil leachate in a gradient of plant richness from levels 1 (one species) to 3 (three species). Plant richness significantly affected the diversity of soil leachate and microbial communities. The amount and diversity of soil leachate, microbial biomass carbon (C), basal respiration, β-1,4-glucosidase activity, β-1,4-N-acetylglucosaminidase activity, bacterial biomass, fungal biomass, total microorganism biomass, and microbial diversity (Shannon diversity index and evenness) were highest at richness level 3. Changes in the microbial community were best explained by variation in the amount and diversity of leachate. Linear regression and correlation analyses indicated that leachate diversity had a close association with microbial Shannon diversity and evenness, whereas leachate amount had a close association with microbial biomass C, total microbial biomass, bacterial biomass, enzyme activities, and abundance of microbial groups. An ordinary least squares multiple regression and the structural equation model demonstrated that leachate amount had a greater effect on microbial biomass than leachate diversity, which had a greater impact on microbial Shannon diversity and evenness. Our results indicate that plant diversity drives changes in soil microbial communities by altering the amount and diversity of leachate in the soil. The diversity of soil leachate determined the diversity of the microbial community to some extent. The online version of this article ( https://doi.org/10.1007/s11104-019-04032-x) contains supplementary material, which is available to authorized users. This work was financially supported by the National Natural Sciences Foundation of China (41771554), and National Key Research and Development Program of China (2016YFC0501707).